Well into Friday evening, was assailed by an intense craving for something sweet but didn’t want to spend too much time making an elaborate dessert. A quick flip through my recipe collection revealed this warm and crunchy pear crisp with a twist, and what a happy coincidence that I had a kilo of fresh blushing pears just bought the day before. Chopping the pear is the only real effort , the rest is easy. And don’t bother peeling the fruit, the peel adds bite and is healthy too. Stopped peeling apples for my crumbles ages ago and friends love it because it noticeably boosts the flavour factor. This is a pear and ginger crisp calls for dried ginger but I also added some chopped candied ginger for extra depth. You could leave it out and it would still be a great, warm dessert for a cold winter night. Preheat the oven to 190 degrees C and lightly butter a baking dish. 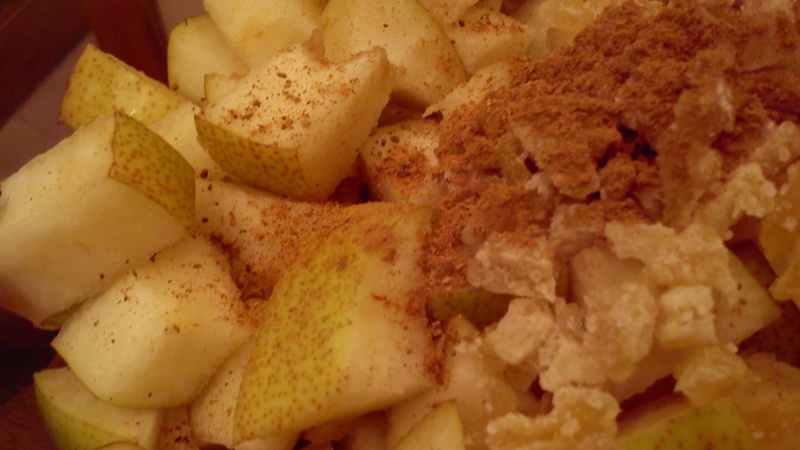 In a bowl, mix the pears with half the sugar, 1 tablespoon flour, ginger powder, candied ginger and half the cinnamon. In another bowl, mix together the flour, oats and remaining sugar and cinnamon with the butter and water to form a crumb. Sprinkle evenly over the fruit mixture and bake for 40 mins or till the fruit is bubbling and the crust is golden.